In the age when 60-70 year old Judas Priest releases relevant albums it is nice to see that a much younger band proves that heavy metal done old epic style, and done right, can still be one of the best listening experiences. 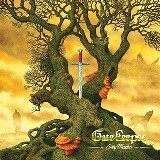 My introduction to Gatekeeper is not their highly acclaimed East of Sun full-length debut, but Grey Maiden EP which followed immediately on its heels. With Grey Maiden Gatekeeper managed to release a new song, re-recorded what apparently is a fan all-time favorite, put out an acoustic track and uncovered an obscure NWOBHM from a band I never heard about before. The new title track just screams epic, reminded me a lot of where Visigoth takes heavy metal these days. The galloping riffs and melody are so energetic, it is impossible they won’t get you in the mood. Looking at the cover while listening to Grey Maiden you imagine the warriors ride to battle, the mystic forest, the supernatural creatures, the Game of Thrones aura, be it on this Earth or in some parallel reality. Tale of Twins is slower, not quite doomy, but has a lot more reserve and less guileless abandon. The hefty riffs get interrupted by extra bass drum kicks and frequent rolls, which elevate the epic element even further. Air guitaring to solo will be a must, but get ready to do it in a mid-tempo fashion. It is the acoustic, Moss, and the opening of Richard III cover which made me notice vocalist Jean-Pierre Abboud. It isn’t that on Grey Maiden or Tale of Twins he doesn’t deliver. But alongside tender acoustics of Moss and then at the beginning of Richard III, the dude rivals Hansi Kursch of Blind Guardian with his vocal gentle/harsh turns and epic warriors Gatekeeper turn into historic minstrels. No wonder Gatekeeper picked Richard III as the track they wanted to cover, as this song by Tredegar is effectively the synthesis of stuff we have heard heretofore on the EP. Taking turns from heroic to tragic, with a superlong involved instrumental middle, the song is as epic as they come and is a perfect fit for Gatekeeper. The EP may only be 20 min long, but I enjoyed every bit of it.